39 West Press, 9780615393612, 80pp. 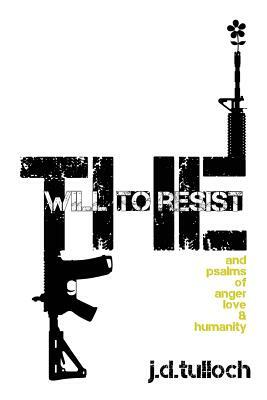 In his first published collection of poetry, The Will to Resist: and psalms of anger, love & humanity, j.d.tulloch asks the reader to momentarily transcend themselves and take a journey through American life in search of the existence of a selfless love that hides itself somewhere within the materialistic excess of an American popular and corporate culture that seems to tame our will to resist by teaching desire can become reality if one chases, captures, and possesses everything possible, as if our spiritual survival singularly subsisted on sadly serving selfish individualism, narcissistic need, and egocentric fantasy. What happened to the will to resist?